GitDone aims to make GitHub Issues easier to use. It’s a simple browser extension that streamlines the GitHub Issues interface for new users and non-developers — and can add handy features and shortcuts that project managers and Task Rabbits will love. GitDone was born at the 2015 Mozilla Festival. It was one of twelve ideas our session came up with for making GitHub easier and more powerful for new audiences. Phillip Smith and the heroic Darren Mothersele then spent the weekend hacking on an early prototype. Right now it’s just a bare-bones proof of concept for developers. We’re hoping the next 0.2 release will start to deliver enough value that we can begin testing and human trials with actual project managers and novice GitHub Issues users. Non-technical users. People new to GitHub or GitHub Issues. Anyone looking for a fast, easy task manager. Or an issue tracker that both technical and non-technical audiences will like and use. In many ways, GitHub Issues is like a “product unto itself.” For a growing segment of users, it’s the only part of GitHub they regularly use. Project managers like me and my team-mates at Mozilla love it. Of all the issue trackers out there (Bugzilla, Asana, etc. ), it’s arguably the easiest to use. And it has a huge added benefit: it’s the same tool our developer colleagues are already using — a major bonus. GitHub can be intimidating for new users. On first use, GitHub looks and smells like a place that’s “just for developers.” That can make it harder for project managers to explain and get their non-technical team-mates to embrace. GitHub’s language and terminology is foreign. For project managers or people just trying to get tasks done, terms like “repos” and “pull requests” don’t make sense. By hiding some of GitHub’s complexity for “Task Rabbits,” our hope is that we can make it easier for new users to understand and get started. We can also make UI tweaks, translate terms and add shortcuts that make project managers’ lives easier. 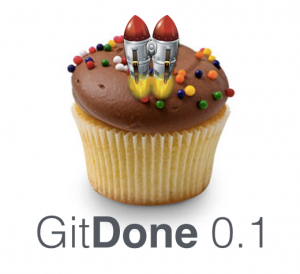 We just released the GitDone 0.1 “cupcake” release — a bite-sized proof of concept. We’d love your ideas and help with release 0.2, which we can then test with some real-life project managers, get feedback, and see whether GitDone 0.3 should… get done. Removing stuff that’s confusing. Hide parts of the GitHub Issues interface that are confusing for new users. Providing some tool buttons for commonly performed tasks. A lot of value can be provided by just by pulling helpful GitHub functions and links into a toolbar.